TechCrunch’s Michael Arrington recently wrote a post praising the fighting spirit of a little startup called Octopart. The New York City-based startup is a search engine for electronic parts that enables users to find esoteric doodads and doohickeys through categorical or keyword searches. Once you’ve found your item, Octopart shows you which distributors sell the part and provides you with a link to buy it. 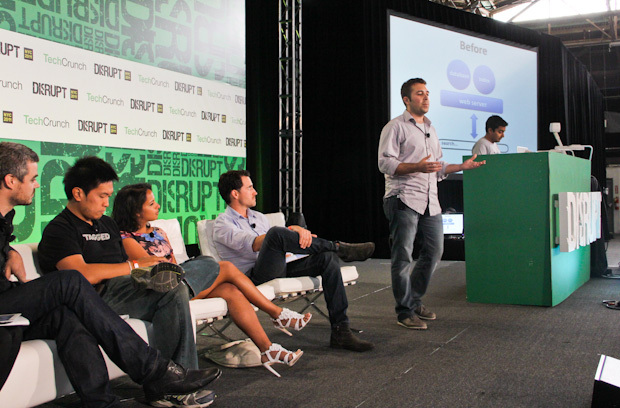 Octopart was financed by Y Combinator back in 2007, and today the Octopart team is launching a new platform live at Disrupt called ThriftDB. ThriftDB, also backed by Paul Graham/YC, and several other angels, is being referred to as “the Amazon Web Services of search”. In the process of building Octopart search, the team says, they were forced to solve various scaling and performance issues related to implementing their search; they were unhappy with existing solutions, so they built their own. Technically speaking, ThriftDB is a flexible key-value datastore with search built in that has the flexibility, scalability, and performance of a NoSQL datastore with the capabilities of full-text search. Essentially, what this means is that, by combining the datastore and the search engine, ThriftDB is offering a service that makes it easy for developers to build fast, horizontally-scalable applications with integrated search. The ThriftDB team says that most websites have crappy internal search, because search itself is difficult to implement on the backend. Typically, sites and users just use Google search, instead of relying on a quality internal search. The team believes that a quality search feature will also be of great appeal to the database market, because in spite of the popularity of NoSQL, most developers are still using relational databases. The ThriftDB team believes that functional internal search is the missing ingredient. As for a business strategy, ThriftDB plans to open-source its core technology to encourage adoption, while charging for a hosted solution with premium features like search analytics and machine-optimized ranking algorithms. Though Octopart and ThriftDB Co-founder Andres Morey tells me that the service will remain free indefinitely for small developers. Also something worth noting, though Octopart hasn’t revealed their current earnings or revenue, the company is seeing $10 million a year in commerce flow. This means that there should be plenty of available cash to pump into ThriftDB to make it into a great internal search option. Google site search isn’t great, as you may have noticed from TechCrunch search. There’s no doubt there’s room for improvement. Q: How did you implement this (for TechCrunch)? A: It took us 20 minutes to set up the search engine. Q: It seems complicated, who are your target customers? A: Developers at smaller startups. Even larger companies, this can make your development time quicker. Q: Who wants to buy you? A: We’re not focused on that. But everyone now, including Salesforce, is focused on the cloud and data. We have plans to opensource the product, which should encourage adoption. Q: What’s are the benefits of defining search with database? How much does it cost? A: We’re going to keep it free indefinitely.